Singapore 777 damaged during tug fire. 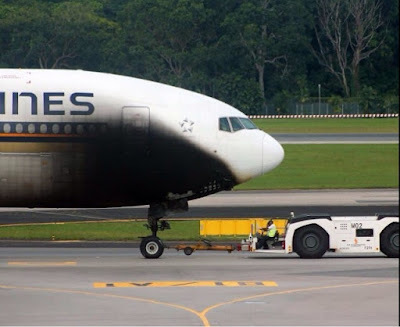 A tug pulling a Singapore Airlines Boeing 777-212ER 9V-SQK caught fire as it was pulling the Boeing 777 from a remote parking bay to a terminal 3 departure gate at Singapore Changi Airport (SIN/WSSS). It was crossing a bridge just after 4am local time when the tow tug caught fire. The fire was put out by ARFF. The lower forward fuselage was covered in soot and there were some major paint damage caused by the flames. A technician who was on the flight deck at the time of the incident evacuated the aircraft. The aircraft was originally scheduled to operate as SQ890 to Hong Kong. Following a change of aircraft, the flight departed at 7.48 am, with only a delay of 13 minutes. SIA said it was working closely with the authorities as well as SIA Engineering Company to investigate the incident. Every year around this time Antarctica Flight (http://www.antarcticaflights.com.au/) charter out Qantas 747's and put on sight seeing flights to the Antarctica. This year there are 5 flights as Hobart will have its first flight this year thanks to the recent runway extensions. Today Sydney kicks off this years flight with Flight 2904, a Boeing 747-438 VH-OEJ (CN 32914) departing Sydney half an hour late, getting airborne from 34L right on 8am Sydney time. Taking around 12 hours, the flights are the easiest way to view this great white Continent. No passports are needed and you are kept warm and safe with a drink in hand while our privately chartered 747 glides effortlessly over amazing scenery. The flight provides a full day of Antarctic experience. Our flight from Australia ranges between 9,500 – 10,500kms round trip (approximately 12.5 hours) depending on your departure city. Expert Antarctic expeditioners are onboard to talk on the polar environment and its history while video screenings depict life on the ground. 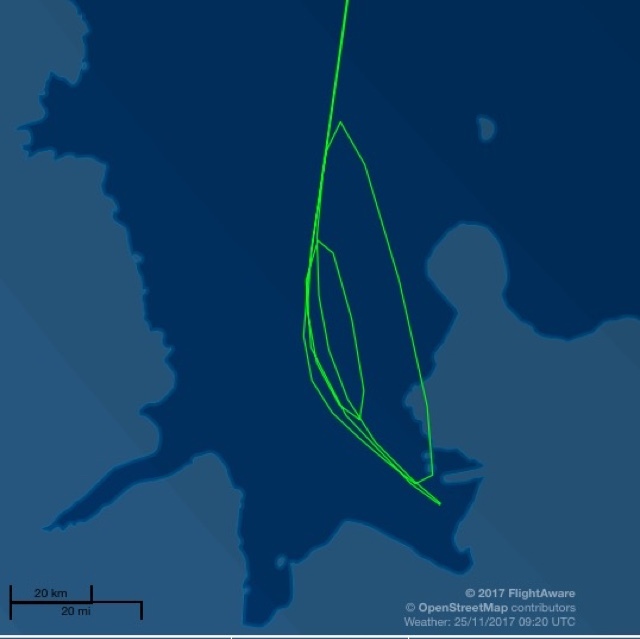 Approximately three hours south of Australia, passengers will usually see the first scattered ice followed by dozens of icebergs and ice floes. We then cross the South Magnetic Pole where you will start to view the rugged mountainous topography of the Antarctic mainland. The flight is not cheap as prices range from $1,199 - $7,999 but I think it would be a once in a lifetime experience. Tiger Airways Australia Pty Ltd, operating as Tigerair Australia, is an Australian low-cost airline. It commenced services on the 23 November 2007 as Tiger Airways Australia. It is a fully owned subsidiary of Virgin Australia Holdings. The airline is based in Melbourne with its main base at Melbourne Airport. 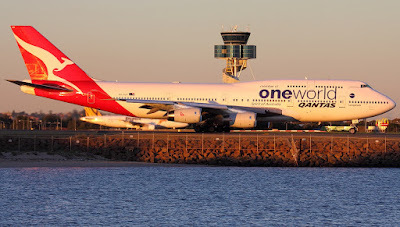 The Civil Aviation Safety Authority of Australia (CASA) grounded the airline in 2011; as a result operating bases at Adelaide and Avalon were shut down and it initially only operated out of its Melbourne base after returning to the air some months later. The airline opened a second base in Sydney in July 2012 and a third base was opened in Brisbane in March 2014. In October 2012, Virgin Australia Holdings purchased 60% of Tiger Airways Australia from parent company Tiger Airways Holdings. and the joint venture between Tiger Airways Holdings and the Virgin Australia Group was launched. On the 17th October 2014 Virgin Australia purchase the remaining 40% so Tigerair Australia is now a fully owned subsidiary of Virgin Australia Holdings. In July this year Virgin Australia and Tigerair confirmed that the entire A320 fleet will be replaced with Boeing 737-800s by the end of 2019. Boeing 737-8FE 3 180 Work will start in March 2018 to add an additional 6 seats (increasing capacity to 186) on all 737-800 aircraft. Tigerair network spans across 24 domestic routes (25 with the addition of new route Hobart-Gold Coast launching in December this year) around Australia. Tigerair Australia currently operates over 600 domestic flights per week, with around 100,000 seats per week available. The airline has flown well over 25 million passengers in Australia since operations commenced in Australia in November 2007. Qatar Airways is the national airline of the State of Qatar. The airline was founded on the 22nd November 1993 and operations began on the 20th January 1994. Amman was the first city served in May 1994 (1994-05). In April 1995 (1995-04), the airline's CEO Sheikh Hamad Bin Ali Bin Jabor Al Thani employed a staff of 75. 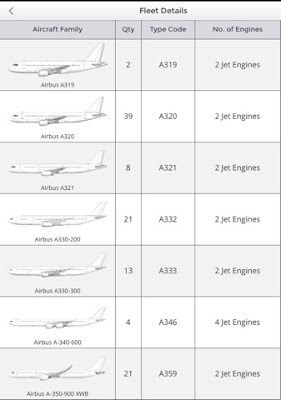 By this time the fleet consisted of two Airbus A310s that served a route network including Abu Dhabi, Bangkok, Cairo, Dubai, London and Tokyo. 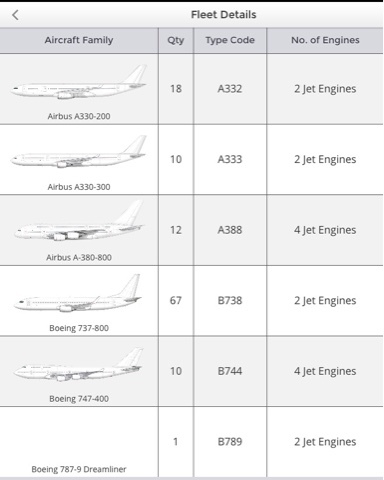 During 1995, two ex-All Nippon Airways Boeing 747s were bought from Boeing. The airline then acquired a second-hand Boeing 747SP from Air Mauritius in 1996. 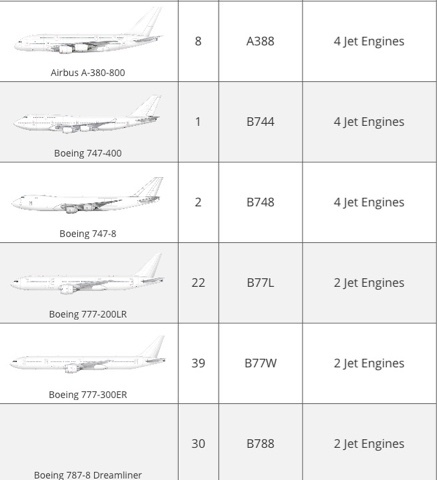 The airline currently has 210 aircraft and has 204 on order. Qatar Airways has one of the world's youngest airlines fleets, with an average aircraft age of approximately five years. Narrow-body and wide-body Airbus and Boeing variants operate a mix of short, medium, and long-haul international routes. In May 2014[update] the airline became fully owned by the Qatari government. Qatar Airways has been fully controlled by the government (2013-07) following the buyout of a 50% stake from a former foreign minister and other shareholders. [update] Qatar Airways Group employs more than 40,000 employee's; 24,000 of them work directly for the airline. In 2014 the airline became the global launch customer of the first Airbus A350. In June 2015, Qatar Airways achieved a major accomplishment receiving the Skytrax Airline of the Year 2015 accolade for a third time. Last year Qatar Airways won World's Best Business Class; Best Business Class Airline Lounge and Best Airline Staff service in the Middle East at the Skytrax Awards. 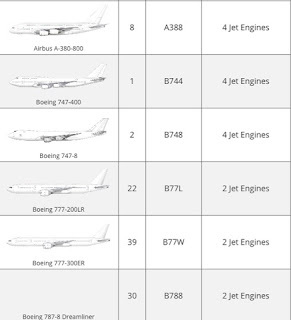 They announced a commitment for 100 Boeing aircraft: 10 777s, 30 787-9s and 60 737 MAX aircraft. One of the biggest orders in the airline’s history, worth more than US$90 billion, the announcement brought the total number of aircraft the airline has on order to more than 350. Qatar Airways has since become one of the fastest growing carriers in the history of aviation with unprecedented expansion averaging double digit growth year on year. Since their launch, Qatar Airways has earned many awards and accolades, becoming one of an elite group of airlines worldwide to have earned a 5-star rating by Skytrax. Voted Airline of the Year by Skytrax in 2011, 2012, 2015 and most recently in 2017. The spokesman added: "Our initial assessment is that the aircraft broke free from its mooring mast for reasons that will be investigated". "We are testing a brand new type of aircraft and incidents of this nature can occur during this phase of development" he said. The 92-meter-long prototype aircraft dubbed "The Flying Bum" cost around 100 million euros ($155,869,145 Aust) to get into the air before it crashed during its second flight. Hybrid Air Vehicles had carried out test flights on Friday and everything went well, but the next day the prototype had malfunctioned. Roads have been blocked around the area due to fears of helium gas and fuel leaks. Hybrid Air Vehicles hoped the Airlander would be used for luxury commercial flights over the world's greatest sights from 2019. It can carry up to 60 passengers and 10 tons of cargo. Earlier this year hundreds of people had gathered to witness the prototype preparing to take off in Cardington Airfield, but the Airlander’s mooring lines got tangled with power lines. The Hybrid Air Vehicles HAV 304 / Airlander 10 is a hybrid airship designed and built by British manufacturer Hybrid Air Vehicles (HAV). Comprising a helium airship with auxiliary wing and tail surfaces, it flies using both aerostatic and aerodynamic lift and is powered by four diesel engine-driven ducted propellers. The Airlander 10 is the largest aircraft flying today. The HAV 304 was originally built for the United States Army's Long Endurance Multi-intelligence Vehicle (LEMV) programme. In 2012, the HAV 304 conducted its maiden flight at Lakehurst, New Jersey, in the United States. In 2013, the LEMV project was cancelled by the US Army. Qantas announced recently it will fly its Boeing 787-9 between Brisbane and Los Angeles by the end of 2018, with the jet continuing on to New York, and follow this with a new US route from Brisbane. Qantas Group CEO Alan Joyce confirmed that the Brisbane-LA route currently flown by a Boeing 747 "will be replaced with a Boeing 787." The Dreamliner would then continue to New York, picking up passengers from the Sydney-LA and Melbourne-LA services, which Joyce said would dramatically improve" the economics of that stateside leg compared to the jumbo jet. The Brisbane-LA service is the third international route for the airline's new Boeing 787-9 fleet, following Melbourne-Los Angeles (which starts 15th December 2017) and Perth-London (which start 24th March 2018) It's also the first route earmarked for the four Boeing 787s which will be based in Brisbane following their delivery between July and November 2018. "In addition we want to fly somewhere new in the states," Joyce said, with the announcement of which city will see the red-tailed Dreamliners to be made "later this year or early next year." "That will either be Seattle where we would work with our partner Alaska Airlines, or it will be Chicago or Dallas working with American Airlines." Qantas Airways Limited, the third oldest airline in the world after KLM (7th Oct 1919) and Avianca (5th Dec 1919) celebrate their 97th birthday today having been founded on the 16th November 1920. Qantas is the flag carrier of Australia and its largest airline in Australia by fleet size, international flights and international destinations. It began international passenger flights in May 1935. The Qantas name stands for "Queensland and Northern Territory Aerial Services", and it is nicknamed "The Flying Kangaroo". The airline is based in the Sydney suburb of Mascot with its main hub at Sydney Airport. 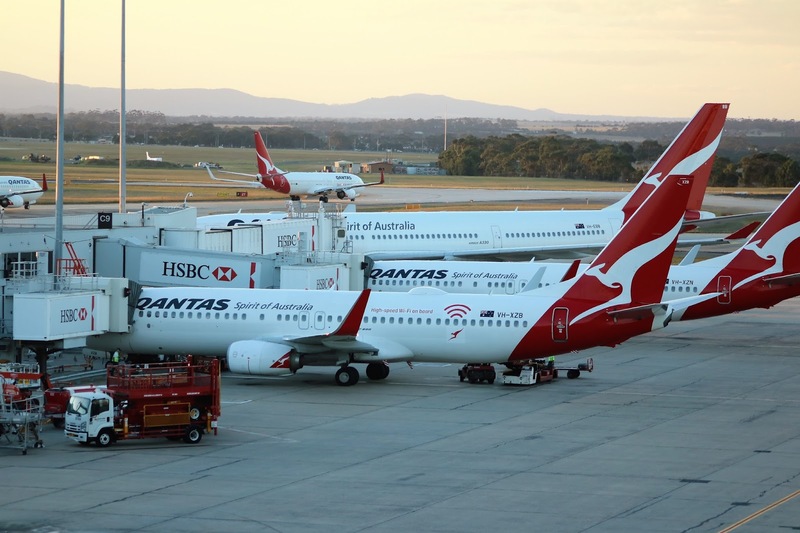 Various subsidiary airlines operate to regional centres and on some trunk routes within Australia under the QantasLink banner. 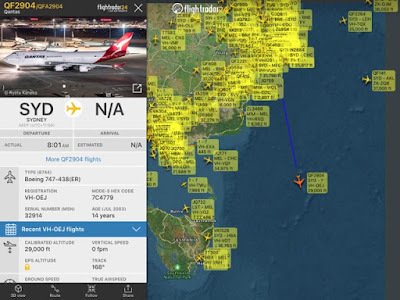 It has a subsidiary airline "Jetconnect" which provides services between Australia and New Zealand, flying under the Qantas brand. Qantas also owns "Jetstar Airways", a low-cost airline that operates both international services and domestic services and operates in Australia and New Zealand. Fergus McMaster was a wealthy grazier who took little convincing about the benefits of aviation. He was crossing the sandy bed of Queensland's Cloncurry River when his car broke an axle. Paul McGinness helped repair the vehicle and the two struck up a friendship. Back in Brisbane, McGinness and Fysh outlined to McMaster their plans for an air service, beginning with joy rides and air taxi trips. McMaster, fired with enthusiasm, convinced business acquaintances to invest with them. With their former flight sergeant Arthur Baird as aircraft mechanic, Fysh and McGinness travelled to Mascot Aerodrome, Sydney, where they ordered two Avro aircraft. The purchase agreement, dated 19 August 1920, was in the name of The Western Queensland Auto Aero Service Limited. A new company name was later adopted, Queensland and Northern Territory Aerial Services Limited, which was quickly abbreviated to the acronym 'QANTAS'. Papers formally establishing Qantas were signed in the Gresham Hotel, Brisbane, on 16 November 1920. The company, based in Winton, was registered with Fergus McMaster as Chairman. In 1921 the Qantas fleet consisted of two biplanes - an Avro 504K with a 100 horsepower (74 kw) water-cooled Sunbeam Dyak engine and a Royal Aircraft Factory BE2E with a 90 horsepower (67 kw) air-cooled engine. The BE2E was purchased for £450 ($900) from Charles Knight, a Longreach stock and station agent who, having experienced a turbulent delivery trip, swore nothing would induce him to fly again. Today QANTAS fleet consists of 118 aircraft. 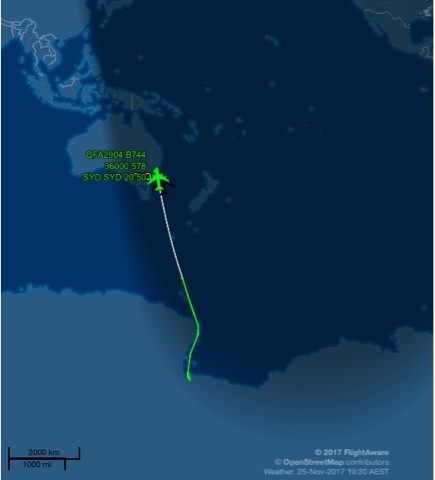 Qantas has 8 Boeing 787-9's on order and their first one was delivered to Sydney on the 20th October 2017, the others will be delivered during the remainder of 2017 and into 2018 with an option of 15 more; these will replace the aging fleet of 747's which will be completely retired by the end of 2020. 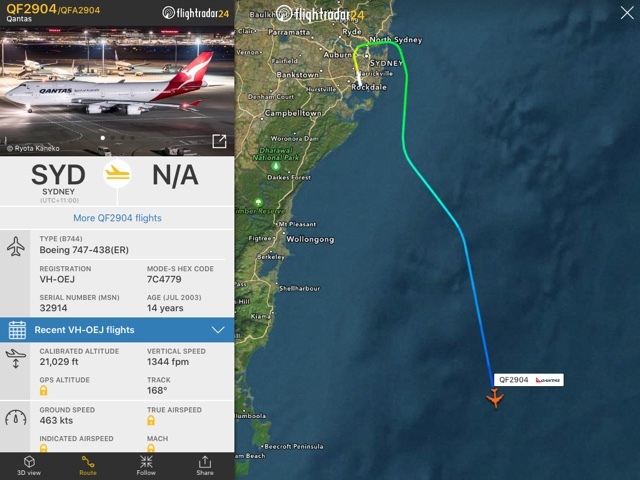 Qantas also had 8 Airbus A380's on order, (out of the original 20 they were going to get) but these have now been cancelled indefinitely. Qantas started changing it's colour scheme in October 2016 and the new scheme will eventually be transferred to every aircraft in their fleet. As I was heading home to Brisbane this afternoon I decided to head of to the airport an hour earlier and do a bit of spotting. I have seen photos from another spot around the airport so today I went in search of this area. After about 25 minutes there I called into Shep's Hill for another 30 minutes or so before heading in to the airport.